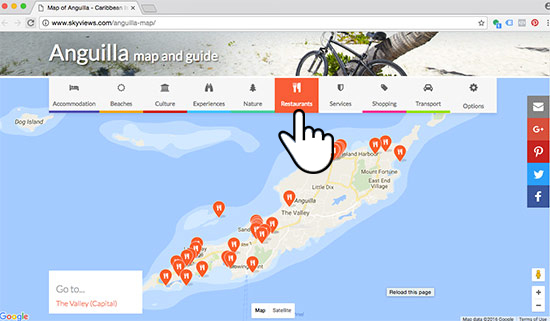 There is one Anguilla map that is a "must" for everyone Anguilla-bound. 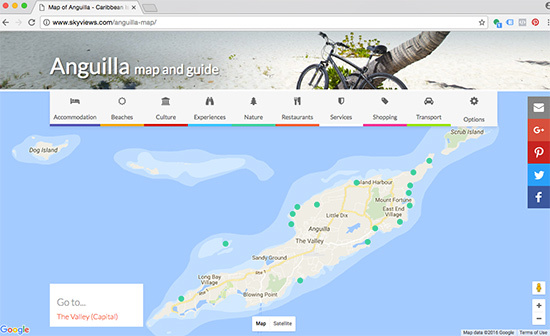 No one makes navigating easier than Skyviews' Anguilla map. Picking one up upon arrival is a near-ritual for many. 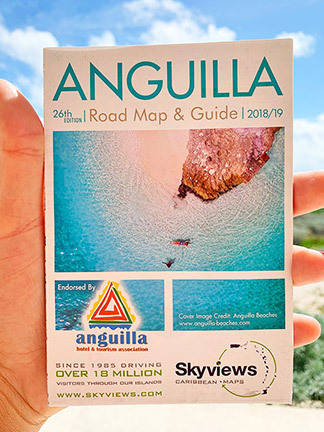 If this is your first trip to Anguilla, or if you haven't yet driven through Anguilla, the Skyviews Anguilla map is a lifeline when you are out on the road. For everyone else, having a copy of the map on-hand simply makes life easier. 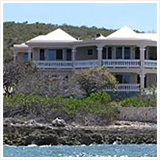 It answers those reoccuring questions... "Where is that in Anguilla?" "What's that business' phone number, again?" 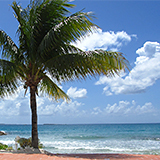 A company based out of Barbados, Skyviews has been helping travelers navigate Caribbean islands for nearly two decades. 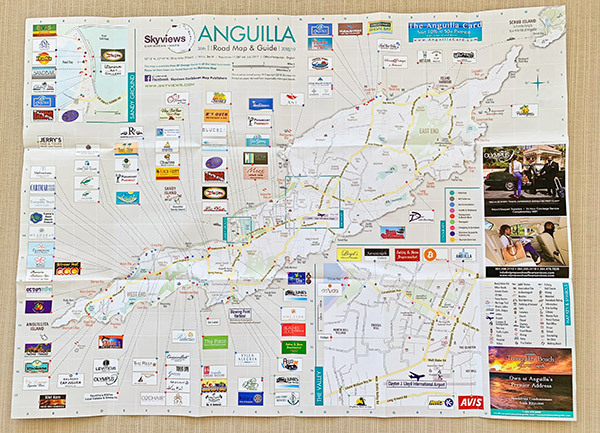 High quality, Skyviews' Anguilla map is beautifully laid out in full color. 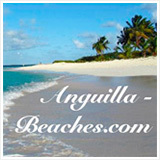 The map's cover features a favorite Anguilla Beaches photo. It really is a souvenir in and of itself. Beyond the aesthetic, the Skyviews' map is conveniently portable. Slim and light, it folds up and makes a terrific pocket reference. When unfolded, it delivers a wealth of useful information. 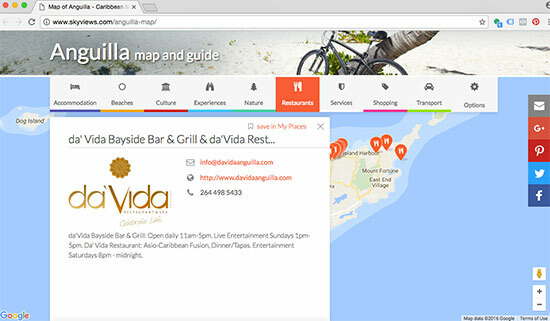 Skyviews' Anguilla map is jam-packed with information. Just about everything you can think of is represented. Roads: Anguilla's main road can be seen in yellow, side roads are reflected in thinner white lines and off-roads and paths are shown with dotted lines. 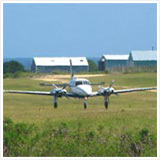 Key services: Airport, ferry terminal, police, hospital, etc. Natural attractions: ... a favorite part of the Skyviews map! 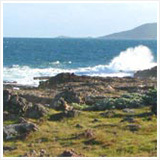 All beaches, snorkeling coves and even hiking trails are shown. Grab the map, hit the road and follow your nose! 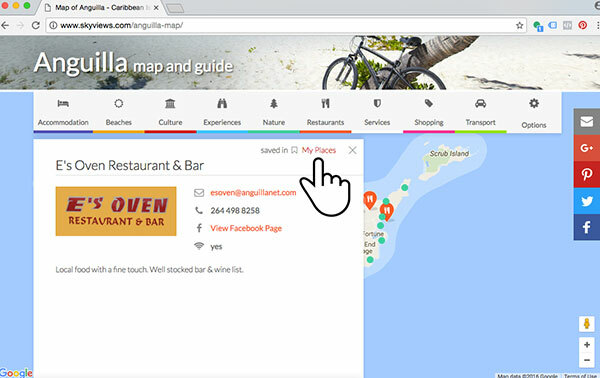 Premier Anguilla businesses: Last, but certainly not least, while you are out exploring with your Skyviews Anguilla map, grab a "thumbnail" look at different businesses around the island. 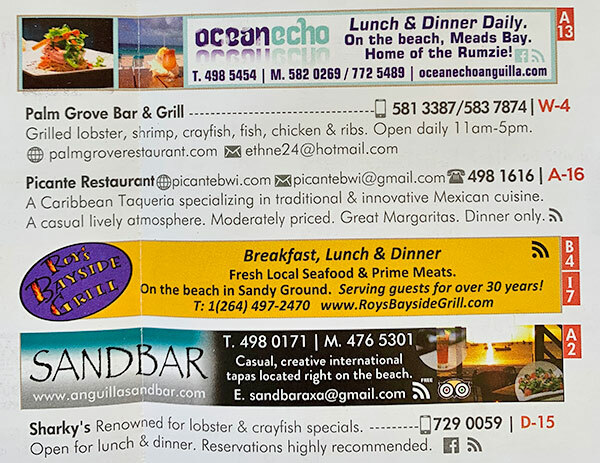 From beach bars, to gourmet restaurants, to boutiques and art galleries, Anguilla's top businesses are highlighted. 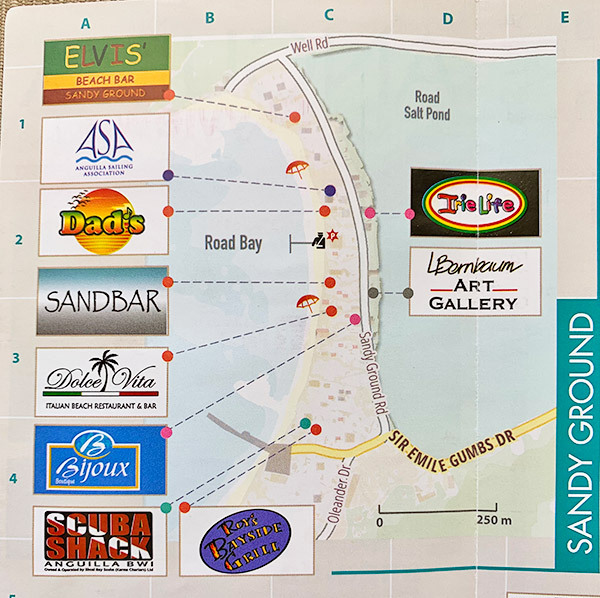 Each business on the map is listed on a grid (see photo to the left). The map's "x-axis" is made up of letters. Its "y-axis" is made up of numbers. Each business has its own coordinate. For example, Palm Grove's is W-4. 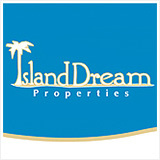 Flip the map over, locate the business coordinate and the business is described, complete with contact information. At the end of a day of exploring, when it's time to return to your hotel, Skyviews makes it easy again. 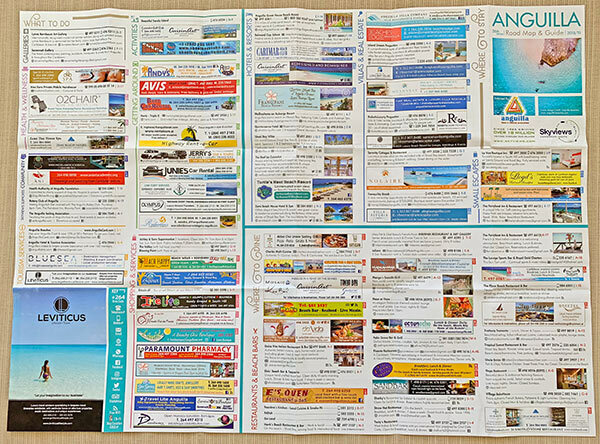 Most hotels are listed on the map. 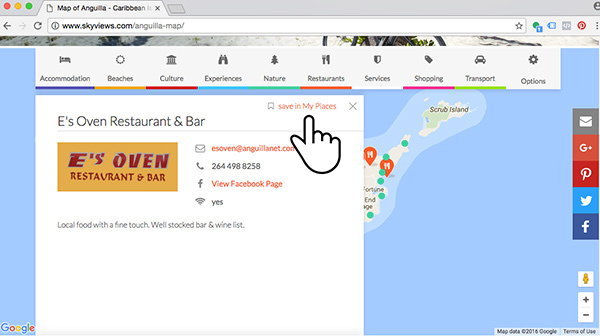 If your hotel is not listed on the map, ask them to join Skyviews. 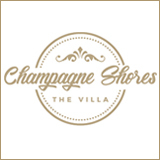 It's an excellent service, especially for first-timers. 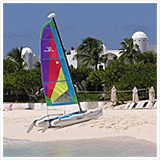 You can pick up your own Skyviews Anguilla map at the ferry terminal, the airport and most hotels and restaurants. The online Skyviews map goes hand-in-hand with the printed version. 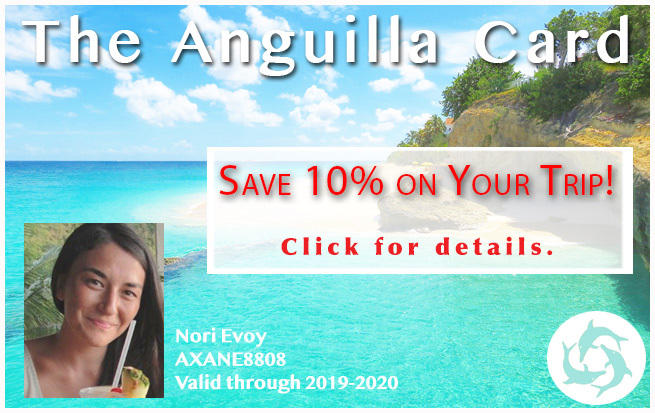 To get your bearings before you arrive in Anguilla, or before you head out for a day of exploring, click over to their website here. 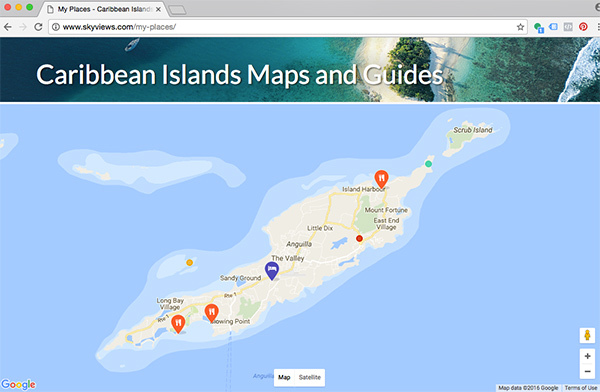 Their interactive Google Map highlights accommodations, beaches, cultural sights, natural sights, restaurants, shops and more. 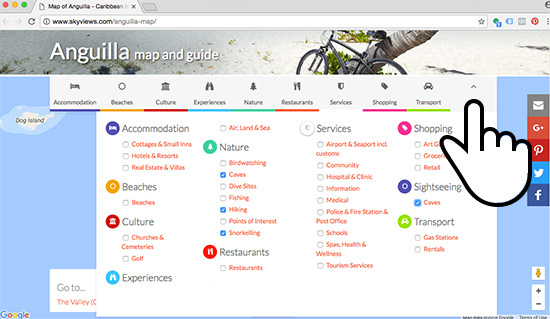 Each category is listed on a navigation bar above the map. Click the map's different tabs. Relevant points of interest appear on the map below. Click any icon on the map for more information on that point of interest/business. To get really granular, click the "options" button on the far right of all tabs. A panel opens. Here, you can refine your search so the map only shows the areas that are of interest to you. Check off your interests (ex., caves, hiking, snorkeling) then click "hide" on the navigation bar. The map shows all of your relevant points of interest only. It gets even better! For each point of interest that appeals to you, click the "save in My Places" link (see photo below). Soon, this will be available as a mobile app as well. 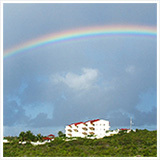 Click here for the Skyviews online Anguilla map. 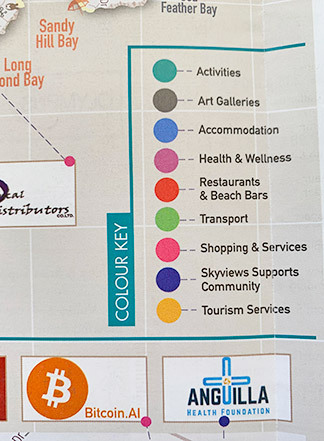 Long a tourist favorite, the 2019 version of Skyviews' map not only looks better than ever, it's more useful than ever, too. 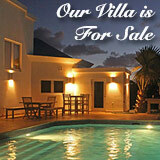 Stay tuned for more updates from Skyviews as they grow their online Anguilla map!